Four of us (Adalay, DNO_Dennis, Lawrence of Berkley, and I) headed over to Kensington Metropark to do some shooting of the birds at the Nature Center. 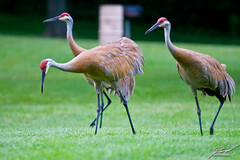 As we pulled in these three young Sandhill Cranes were walking around one of the picnic areas. With an opportunity to shoot this close we had to stop. We're pretty sure that these were the same babies we'd caught a couple times last year.